Sewage sludge ashes provide interesting possibilities to recycle phosphorus (P) to soil, although the immediate plant availability is often low. The objective of this work was to increase the P-fertilising effect of sewage sludge ash through inoculation with the phosphate-solubilising fungus Penicillium bilaiae. In a soil incubation study, ash amendment enhanced the content of water-extractable P, but in contrast to previous in vitro experiments, inoculation with P. bilaiae did not further increase P availability, probably due to limited competitiveness of the fungus in soil. In a micro-plot field trial, a moderate P fertiliser effect of the ash was found without any additional effect of P. bilaiae ash inoculation on plant biomass and P-uptake. However, soil microbial functions determined by the MicroResp™ method were not negatively affected by the ash amendment. In conclusion, inoculation with P. bilaiae did not prove to be a suitable strategy to enhance P availability from sewage sludge ash. 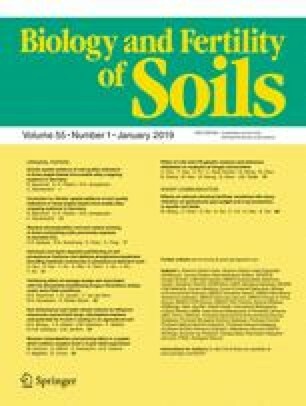 A better insight into the fungus’ ecology and colonisation ability in soil and rhizosphere as well as into its interactions with ash P is needed to further develop such alternative P-fertilising approaches. The online version of this article ( https://doi.org/10.1007/s00374-018-1326-1) contains supplementary material, which is available to authorized users. The authors would like to thank Lena Byrgesen, Thomas Hansen, Lene Vigh, Klara Gunnarsen, Jingna Liu, Daniel Ortiz Gonzalo, Enno Sonntag and Jannie Jessen for their support with the sample analysis and setting up the field trial, Jakob Magid for providing access to the field trial location and Tobias Thomsen for providing the ashes and biochars. This study was supported by Innovation Foundation Denmark (grant number 1308-00016B to the project Microbial biofertilisers for enhanced crop availability of phosphorus pools in soil and waste, MiCroP).